I can find no evidence that Harold Gosney ever lived or worked in Yeovil but, since his name is inscribed on the War Memorial in the Borough, I have given him his own page here. Harold Gosney was born in Sherborne, Dorset, in 1891. He was the son of wheelwright Frank Gosney and his wife Harriett. The family were living in Cold Harbour, Sherborne, in the 1901 census. By the time of the following 1911 census Harold was a career soldier. Having enlisted in Brecon, he was serving with the 1st Battalion, South Wales Borderers in Breconshire. His Service Number was 10644. At the outbreak of war the 1st Battalion was stationed at Bordon as part of the 3rd Brigade of the 1st Division. On 13 August 1914 the battalion was mobilised for war and landed at Le Havre. The 1st Battalion were straight into battle and took part in the Battle of Mons. The Battle of Mons, 23 August 1914, was part of the wider Battle of the Frontiers. It was the first battle fought by the BEF since its arrival in France. On 22 August the five divisions of the BEF (four infantry and one cavalry) reached the Mons-Condé canal and took up positions along twenty miles of the canal. Sir John French, the commander of the BEF, had been expecting to join a French offensive into Belgium, but this plan had been based on a misunderstanding of the German plan. On 22 August the French had suffered a serious setback at the Sambre, when their Fifth Army had been attacked by the German Second and Third Armies. During the night of 22 August French received a request to launch a counterattack against what was believed to be the right flank of the German army advancing through Belgium. This belief was mistaken. The German First Army was advancing directly towards the British position - there was no open flank to attack. On 23 August the First Army collided with the thin British line. 70,000 British soldiers with 300 guns faced as many as 160,000 Germans, supported by 600 guns. Although they were badly outnumbered, the British did have two big advantages. Both came from the professional volunteer nature of the British army. The British regular soldier of 1914 was expected to be able to fire fifteen aimed shots per minute. At Mons the British rifle fire was so rapid and so accurate that many Germans believed they had been facing massed machine guns. Although the British fought well and inflicted disproportionate casualties on the numerically superior Germans, they were eventually forced to retreat due both to the greater strength of the Germans and the sudden retreat of the French Fifth Army, which exposed the British right flank. Though initially planned as a simple tactical withdrawal and executed in good order, the British retreat from Mons lasted for two weeks and took the BEF to the outskirts of Paris before it counter-attacked in concert with the French, at the Battle of the Marne. On 19 October 1914 the 1st Division began a protracted period of fierce combat in what was to become known as the First Battle of Ypres, as the Germans opened their Flanders offensive and the Allies steadfastly resisted, while seeking their own chances to go on the attack wherever possible. Fighting continued, with heavy losses on both sides, until 22 November, when the arrival of winter weather forced the battle to a halt. After engaging in the Winter Operations of 1914-15 the 1st Battalion was next engaged in the Battle of Aubers Ridge - a British offensive on the Western Front on 9 May 1915. The battle was part of the British contribution to the Second Battle of Artois, a Franco-British offensive intended to exploit the German diversion of troops to the Eastern Front. The French Tenth Army was to attack the German 6th Army north of Arras and capture Vimy Ridge, preparatory to an advance on Cambrai and Douai. The British First Army on the left (northern) flank of the Tenth Army, was to attack on the same day and widen the gap in the German defences expected to be made by the Tenth Army and to prevent German troops from being moved south of La Bassée canal. This battle was an unmitigated disaster for the British army. No ground was won and no tactical advantage gained. It is doubted if it had the slightest positive effect on assisting the main French attack 15 miles (24 km) to the south. Private Harold Gosney was killed in action on 23 September 1915, during the day-to-day trench fighting on the Western Front. He was 24 years old. and was interred in Vermelles British Cemetery, Vermelles, Nord-Pas-de-Calais, France, Grave VI.D.4, and his name is inscribed on the War Memorial in the Borough. 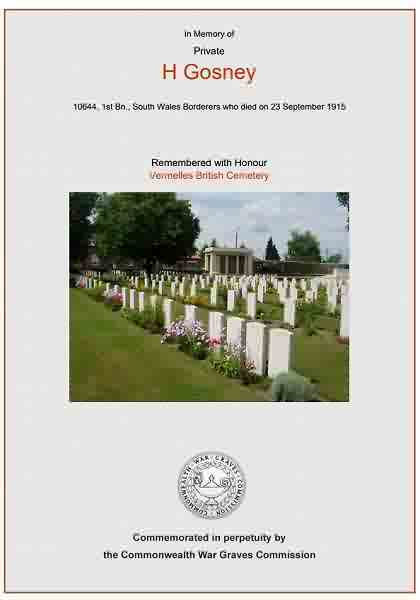 The Commonwealth War Graves Commission certificate in memory of Harold Gosney.